1 January 1889: Johann Theodor von Ravenstein was born in Strehlen, Germany. 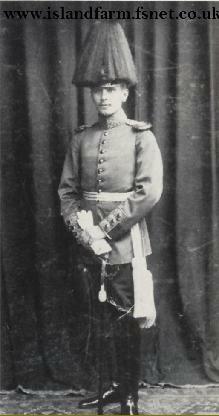 His father, Fritz von Ravenstein (1863-1905), was an Army officer. His great-grandfather, Johann Friedrich August von Ravenstein (1792-1874), served in the Prussian Army against Napoleon, 1813-1815, and received the Iron Cross, 1st Class. An adjutant to Generalfeldmarschall Prince Gebbhard Leberecht Fürst Blücher von Wahlstatt, he served as an aide-de-camp to the Duke of Wellington at the Battle of Waterloo on 18 June 1815. 1899: Entered the Cadet Institute at Wahlstatt. 1903: Entered the Senior Cadet Institute at Gross Lichterfelde (he also served in the Corps of Pages at the court of Kaiser Wilhelm II). 24 March 1909: Commissioned a Leutnant in Grenadier-Regiment König Wilhelm I (2. Westpreußisches) Nr.7. 1912: Transferred to 7. Westpreußisches Infanterie-Regiment Nr.155. 15 June 1915: Promoted to Oberleutnant. 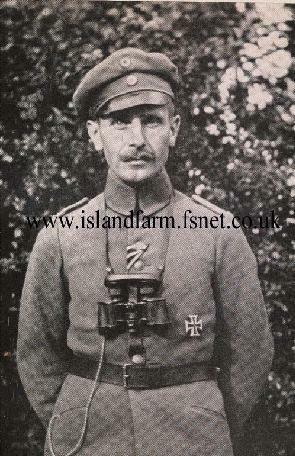 30 March 1918: Assumed command of the I Battalion of Füsilier-Regiment von Steinmetz (1. Westpreußisches) Nr.37. June 1918: Promoted to Hauptmann. 31 March 1920: Separated from the Army. After attending university, he worked for an electrical company in Duisburg and, later, worked for the city government. 1 May 1934: Returned to the Army with the rank of Major and command of II Battalion of Infantry Regiment 60. 1 October 1936: Promoted to Oberstleutnant. 24 November 1938: Received command of Schützen Regiment 4 of the 6th Panzer Division. 1 August 1939: Promoted to Oberst (RDA 1 April 1939). September 1939: Took part in the campaign in Poland. May-June 1940: Took part in the campaign against France. 3 June 1940: Awarded the Knight's Cross of the Iron Cross. 15 July 1940: Received command of 16th Schützen Brigade of the 16th Panzer Division. April 1941: Took part in the campaign in Greece. 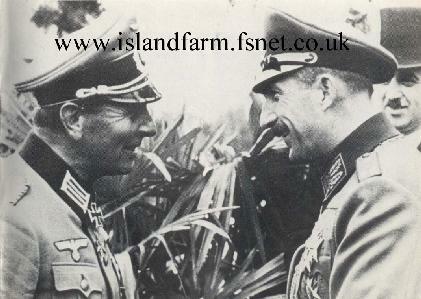 20 May 1941: Promoted to Generalmajor. 20 May 1941-1 October 1941: Commanded the 5th Light Division in North Africa (this division was reorganized, strengthened and redesignated 21st Panzer Division on 1 October 1941). 1 October 1941-29 November 1941: Commanded the 21st Panzer Division in North Africa. 29 November 1941: He was captured by New Zealand troops near Tobruk on his way to a staff meeting at Afrikakorps headquarters. 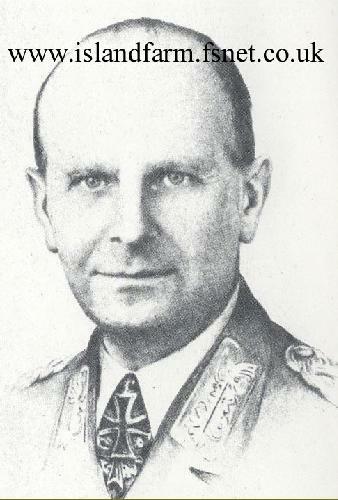 He thus became the first German general captured during World War II. 30 November 1941: Arrived at Tobruk. by New Zealand troops, 29 November 1941. 5 December 1941: Departed Tobruk aboard the British vessel Chakdina; torpedoed and sunk that evening by enemy aircraft. Rescued by the British corvette HMS Thogrim. 7 December 1941: Arrived at Mersa Matruh; flown to Alexandria and then to Cairo. 9 March 1942: Departed Cairo for Durban, South Africa aboard the ocean liner Pateur. 18 March 1942: Arrived Durban. 29 April 1942: Departed Durban aboard the steamer Nieuw Amsterdam. 5 May 1942: Arrived at Simonstown; transferred to ocean liner Queen Elizabeth the next day; departed on 7 May. 22 May 1942: Arrived at New York, New York; departed aboard train on 24 May for Canada. 25 May 1942: Imprisoned at Bowmanville Prisoner of War (POW) camp in Ontario, Canada. June 1943: Transferred to Grandeligne POW camp in Quebec, Canada. 1 October 1943: Promoted to Generalleutnant. July 1945: Transferred to Farnham POW camp in Canada. 13 June 1946-25 November 1947: Returned to the United Kingdom and imprisoned at Island Farm POW Camp in Bridgend, Wales until his repatriation to Germany. 26 March 1962: Died in Brehmsweg, Germany. 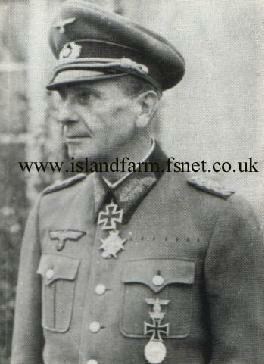 Knight's Cross of the Iron Cross: 3 June 1940, Oberst, Commander of Schützen Regiment 4 of the 6th Panzer Division. Prussian Order Pour le Mérite: 23 June 1918, Oberleutnant, Commander of I Battalion of Füsilier-Regiment von Steinmetz (1. Westpreußisches) Nr.37. in conversation with King Boris III of Bulgaria (right). He [Generalleutnant Johann von Ravenstein] rather disliked Bridgend in comparison to the camp in Canada [Bowmannville] where they had found great understanding. At Bridgend the generals were more strictly confined than the orderlies. The latter were allowed occasional visits to English families they knew, but not the generals. What my husband regretted very much at Bridgend was the fact that it was entirely a general's camp, the majority "Hitler's generals" which was what we called rapidly promoted officers, who may have been efficient, but whose bearing and manners were not what one understood a general to posses. At Bowmannville there had been only young POW officers; thus my husband was able to work with them and for them: listening, advising, trying to patch up family marriages, etc. Apart from the favourable external circumstances-the farm, the lecture courses, and finally even the connection with Toronto University, which allowed its professors to visit the camp-to co-organize, just to help was very much in his line. Boris III's six-year-old son, Simeon II, ascended to the throne in 1943 upon the death of his father. Simeon fled the country in 1946 when the Communists took over and lived in exile in Spain until just recently. 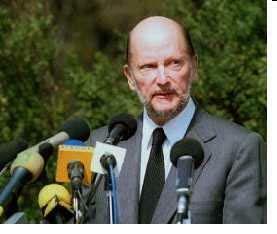 Simeon never abdicated the throne, so his title of "King of Bulgaria" remained valid. He goes by the name of "Mr. Saxe-Coburg-Gotha," his royal house title. He's a distant cousin of Queen Elizabeth II who is also of the House of Saxe-Coburg-Gotha via her relation to Albert, Prince Consort of Queen Victoria. The first monarch from Eastern Europe to return to political power in his homeland since the collapse of Communism. In a historic first for Eastern Europe, former King Simeon Saxe-Coburg-Gotha accepted the role of prime minister on July 12, with full support of the party he founded, the National Movement Simeon II (NMS). "With great emotion but with a sense of responsibility, and having in mind the trust that the voters gave me on June 17, I accept this proposal," Simeon said.